The Springbok (Antidorcas marsupialis) is one of the most beautiful and graceful antelope of the Kalahari. The name of this antelope comes from the Afrikaans word "spring" which means to jump. Its very unique trait of pronking (see below), will make you understand why our anchestors gave it this specific name. A chocolate brown band along the flanks of the springbok separates the bright cinnamon brown upper parts from its white under parts. The head is white with brown stripes on both sides that run through the eyes to the corner of the mouth. Springbok have a pocket-like flap of skin lined with white hair that extends from the middle of their back to their rump. This white hair is usually folded out of sight into a narrow pouch. When excited or frightened, this flap turns inside out, revealing the highly visible crest of erect white hairs along its back. This act of display is a very distinctive behaviour of the springbok. See under "Pronking" more about this interesting act. The adult animals have a shoulder height of ± 80cm (31.5inch) and weight up to 60 kg (132lb) in the Kalahari (springboks are usually bigger in the Kalahari than in other parts of Southern Africa). Although both the males and females have black, ringed horns, the males' are thicker. A very good size of trophy horns are ± 38cm (15 inches).Springbok males are also bigger in body with thicker necks than the females. These animals can fight fiercely with their horns - more so than most other antelope species. They often clash and lock their horns and wrestle ferocious to pull their opponents off balance. These fights occur when the males establish their territories. They mark their territories by thrashing and picking up vegetation with their horns. This give them sometimes a "head dress" of tangled vegetation that looks quite funny. The rings on the horns of the older animals are most of the time smoothed and chipped even though it lacks lenght. Chipped horns full of marks is common and it gives horns real character when one considers the males' lifetime of defending its females from intruder-males. You see, the territorial males also have to tolerate the presence of other males due to mixed herd congregations (just like humans:-), BUT only the territorial males breed! And they make sure of this by fighting to death when necessary. The Kalahari is certainly one of this antelope's most preferred habitats. They can also be found in other semi-arid regions and even the Namib desert. Its ability to survive indefinitely without drinking water, makes it a true desert antelope. Springbok change their diet according to availability and feed selectively for nutrients. They prefer young, tender grasses or low shrubs and even dig out roots and bulbs for moisture. In the Kalahari wild melons and cucumbers are often eaten for their water content. Springbok will eat soil as a source of minerals. Some plants which are toxic and unpalatable to other animals, are eaten by this antelope without harmful effects to their digestive systems. The reproductive patterns of the Kalahari's springbok are very intriguing. They seem able to take advantage of favourable conditions. The precise cue is uncertain to us, but it results in springbok-population-explosions. They normally mate during the early dry season, and give birth 24 weeks later during the beginning of the rainy season. This is the best time for lambs to be born, since food is usually abundant. At the beginning of the mating season, the territorial ram starts to herd the ewes which are on heat onto his ground. Here he puts in an enormous amount of effort to keep out possible rivals. The rams tend to suffer a degree of physical deterioration since they do not feed properly and are very active (you can imagine!) during this time. Springbok often go into bouts of repeated high leaps (up to 4m /13 feet) into the air in a practice known as "pronking" (the Afrikaans word pronk means to show off) or "stotting". While pronking, the springbok leaps back into the air as soon as it comes down, with its back bowed and the white fan lifted. The Latin name Marsupialis comes from the presence of this pocket-like skin flap which opens the crest of white erected hair on its back. While the exact cause of this behaviour is unknown, springbok exhibit this activity when they are nervous or otherwise excited. One theory is that pronking is meant to indicate to predators that they have been spotted. Another is that springboks show off their individual strength and fitness so that the predator will go for another (presumably weaker) member of the group. When fleeing from a predator, springbok do not pronk, but rather run at speeds of up to 80 km/h (50 mph). 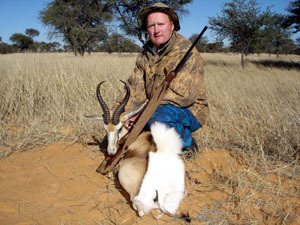 Another theory is that pronking enhances vigilance and gives the members of a herd a clear view of the surrounding countryside and its dangers. Apps wrote in his book "Wild Ways"(2000: 156) that this pronking action seems to tell predators "Don't bother chasing me, I'm fast and agile so you might not catch me!" 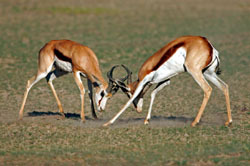 However, this most distinctive defensive behaviour of the springbok, is a captivating sight. This crest that opens during pronking, grows out of a strip of glandular skin that produces a waxy secretion. The odour(almost like honey) of this sectretion is released as the crest is flared. Anyone that ever smelled this, will know that few odours match the richness and sweetness of the springbok's pronk (see on the picture the open pronk of Coenraad's trophy springbok). Trophy Hunting in the Kalahari will proof to be enriched with lessons from nature and the animals of the African wildlife. These experiences in itself will be trophies to remember and cherish forever. I created this website with the help of Solo Build It. It's been an incredible journey for me.